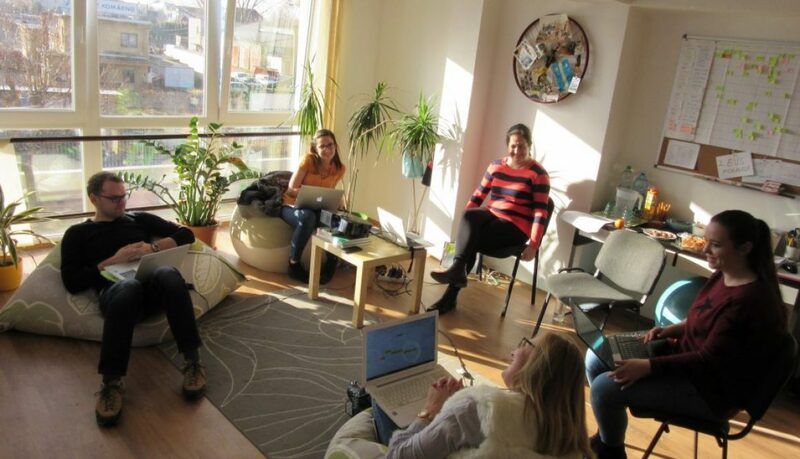 On 29 January 2019, our partner organization from Slovakia, TANDEM n.o., led an additional train-the-trainer workshop for teachers, administration workers, NGO staff and other people engaged in youth work. The event gathered more than 20 participants who had the opportunity to better understand how to play and facilitate New Shores - a Game for Democracy. All of them were really enthusiastic about the experience, praising the game for its capacity to engage young people in a meaningful discussion on a serious topic. Thank you for this quality time with us! Just a couple of days before our project would officially end, the Rogers Foundation managed to reach one important goal for us: We took New Shores to the Rogers Person-Centred Primary School. The roots of the school and the Foundation are connected, thus Zsuzsa from The Rogers Foundation was very happy to visit the kids. On 28th of January, 2019 a group of 14-15-year-olds join the New Shores workshop. We had only 30 minutes for the session, but even this short time was enough to introduce the game and have a great first impression of it. The kids really liked the game, and their headteacher obliged to start a discussion about the foundations of democratic societies. Thank you for your participation, guys! It has been the first time that the Rogers Foundation went outside of Budapest for a New Shores workshop! 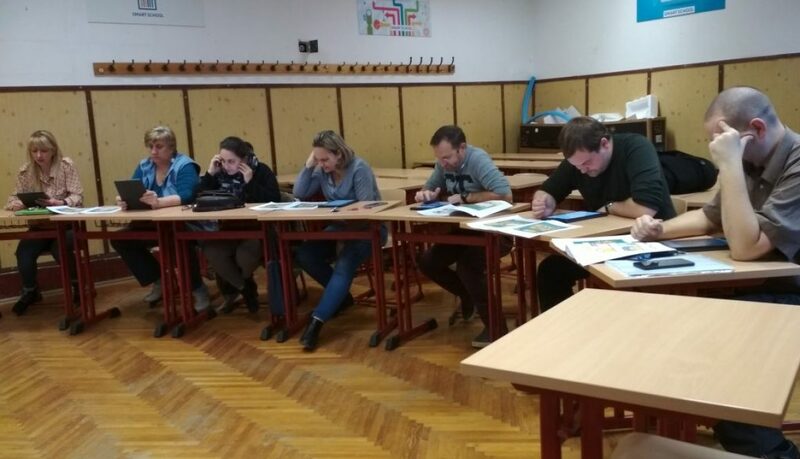 The organization came into contact with one of the school leaders of Szilády Áron Gimnázium in Kiskunhalas (Southern Hungary) during a conference in November – things quickly escalated, and the Rogers Foundation was invited to lead a teacher training workshop there! The Rogers Foundations’s executive director, Levente Turóczi traveled to Kiskunhalas on the 14th of January, 2019, and led the New Shores workshop for 14 members of their staff. They played the game and discussed its relevance for their school. As they said, they enjoyed the workshop very much and will use somehow the game later on. Thank you for the invitation, we hope you found it useful! Our partner organization from Slovakia, TANDEM, n.o, led a train-the-trainer workshop on the 12th December in Komarno. Most of the participants were either teachers working with youth or active representatives of NGOs. Their main objective is thus the youth competency development. 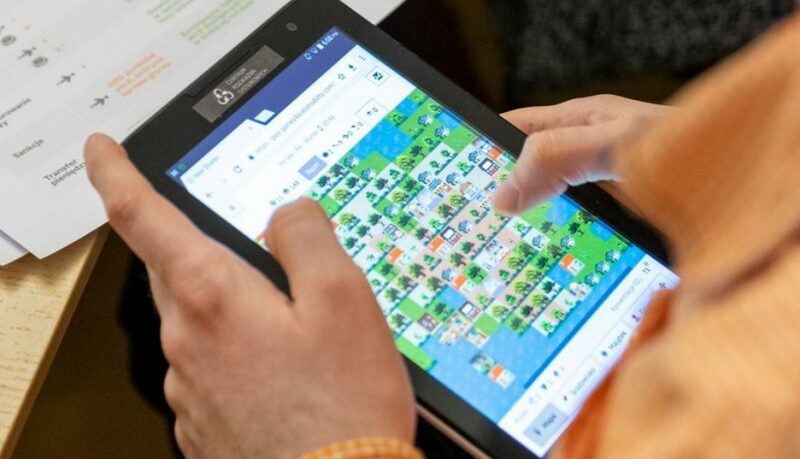 During a 4 hour long event the participants played the game, learned how to manage it as moderators and facilitators, and got to know how to join the New Shores class on the Edmodo platform. The game and all the accompanying materials met with a very positive and enthusiastic response from the participants as they were already forming their plans of using the game in their own work. 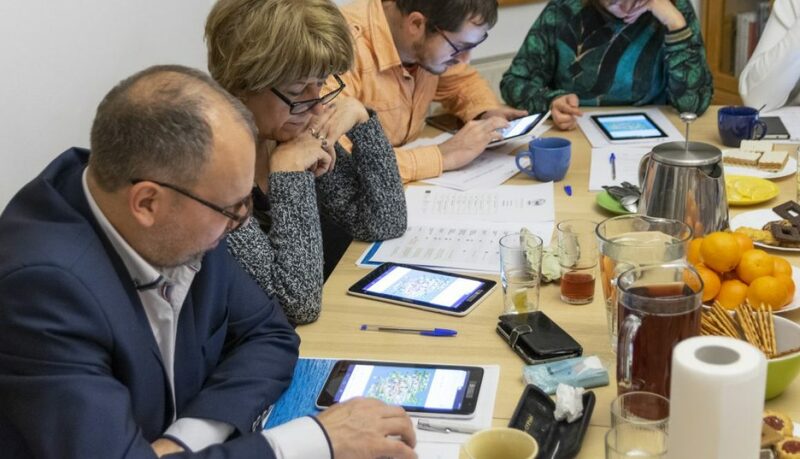 The December event in Slovakia is only the beginning of a longer cycle that is going to gather at least 20 people interested in incorporating the New Shores game into a daily didactic practice. 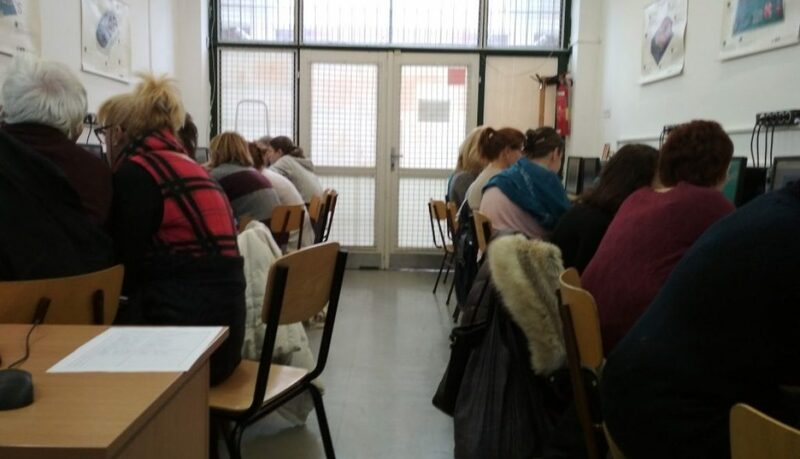 On the 1st of December, The Rogers Foundation seized a new opportunity to try the New Shores game with teachers, this time at the Németh Imre Általános Iskola (a primary school) in Budapest. In the school there was a staff training day with several workshops running parallely for all the teachers, so there were some 50 teachers present altogether. 18 of them enrolled for the New Shores workshop. The group’s environmental awareness was amazing! They were so protective of the island that the forest condition was higher at the end of the game than at the beginning. Great job! After playing the game, we triggered a discusson on why and how to run a workshop with their students. We hope that the youth will be able to beat their teachers’ scores! In the afternoon of the 29th of November The Rogers Foundation visited the Eötvös Loránd Szakgimnázium, a high school in Budapest for a workshop for the staff of the school. Eight teachers came to play the game and learn how to incorporate it into their curricula. A serious discussion about the topics the game raises was intertwined with laughs and jokes. All the teachers expressed their interest in using the game with their students, thus we hope it will be a great experience for all of them! 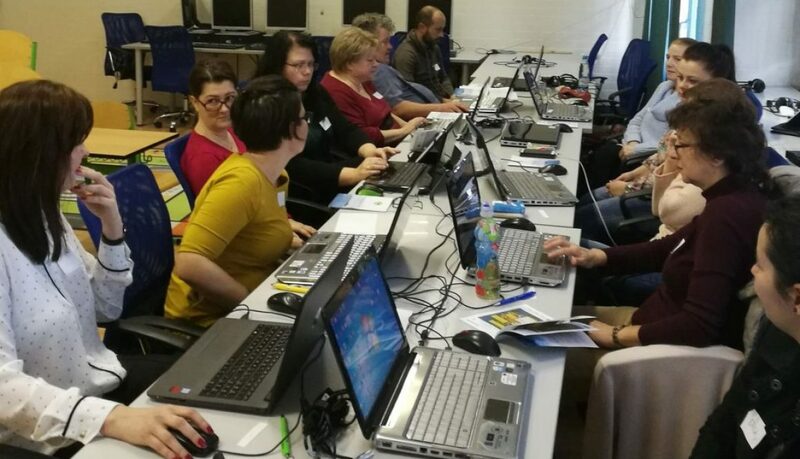 On the 25th of November, Rogers Foundation held their train-the-trainer workshop at the Eötvös Loránd University’s Faculty of Primary and Pre-School Education in Budapest, Hungary. 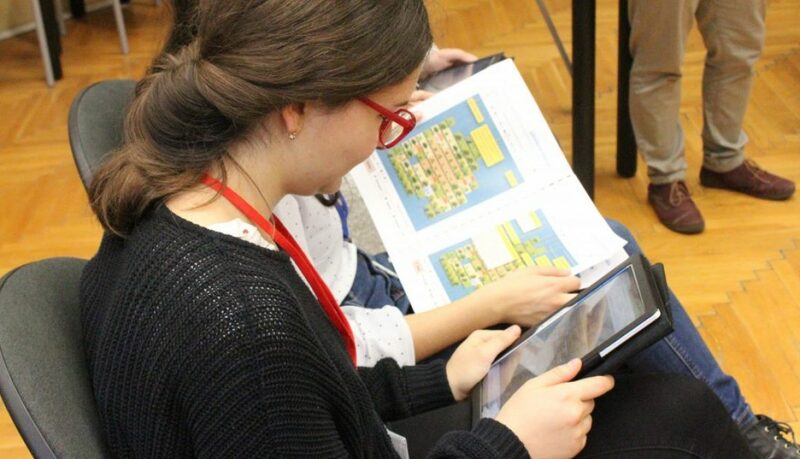 The training was held as part of a bigger conference around play and games in education, called “Akarsz-e játszani” (“Do you want to play?”) and gathered around 80 people. The event started with an opening lecture by Zsuzsa Vastag about the methodology of educational and complex serious games. Later participants were divided into three groups to visit parallel workshops on different educational games and methods. 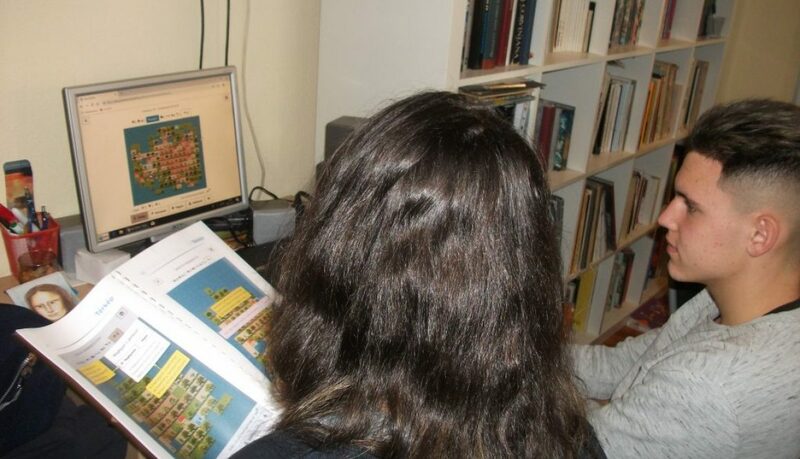 20 participants took part in the practical train-the-trainer workshop for future moderators of the New Shores game. They had the opportunity to play the game and to gain know-how on how to use it in educational contexts. At the last step, all participants of the conference gathered together again for closing the event. Everybody shared their experiences and what they had taken away from the event. According to their feedback, the participants enjoyed it very much and thought it was very useful for them and will use the techniques in their work later on. The Rogers Academy (a „non-school” run by the Rogers Foundation) organizes the so-called Eco Day two times a year; one in the Autumn, and one in the Spring. On these occasions students can take part in various ecology and nature related activites. This year, the Rogers Foundation organized the Eco Day on the 13th of October, and among activities such as planting flowers, trimming the bushes in the garden or composting, students had an opportunity to play the New Shores game. It was the first time for The Rogers Foundation to try the game out with a younger audience (students aged 13-20). Therefore the organizers were very excited at how they would react to the game. 16 students and 4 parents/relatives took part in the workshop. The game went smoothly, as the students (and parents) got to know their island and started building and planting, facing some difficulties as well. The group was highly cooperative and no major conflicts emerged. The debriefing session after the game proved that they all appreciated the experience and would be willing to try it again to check what they can do differently. So, maybe in the Spring we will have some follow up? 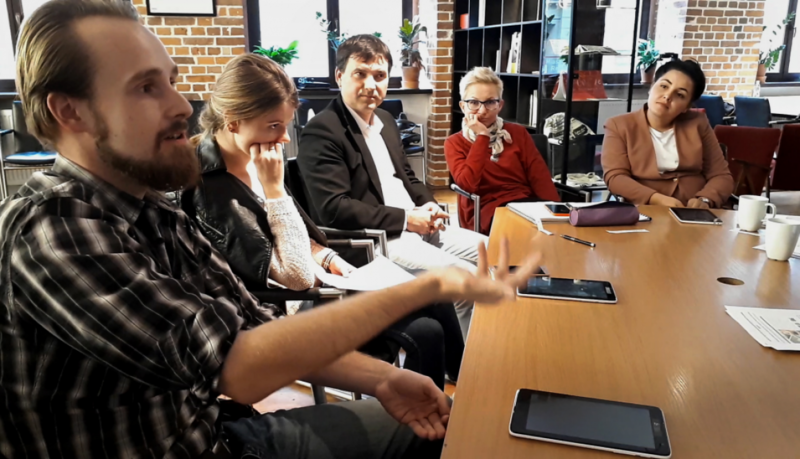 On October 6 we had an opportunity to invite educators, librarians, NGO and cultural workers to a whole-day train-the-trainer workshop for future moderators of the New Shores game. During the meeting conducted by Damian Dec from Damian Dec Instytut Inspiracji and Ola Solińska-Nowak and Michał Pająk from CRS, the participants gained knowledge and skills to prepare a News Shores workshop, based on the methodology guide and workshop scenario, developed in cooperation with TANDEM n.o. and Rogers Foundation. 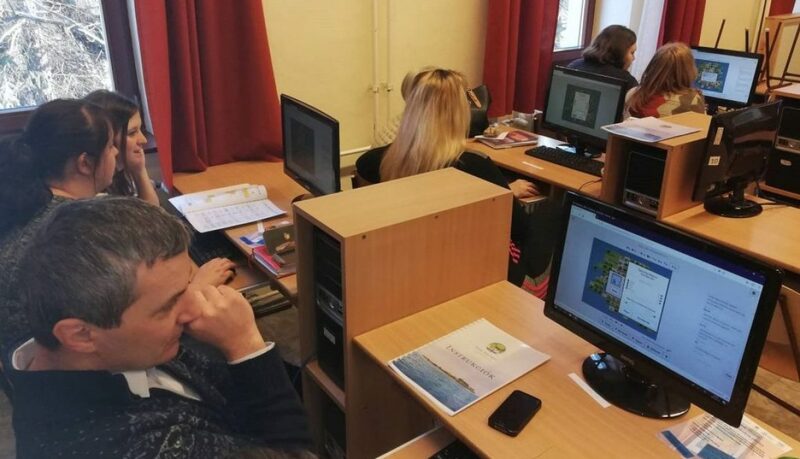 The future New Shores moderators got familiar with the functionalities of the Edmodo platform, where we host a 9-day e-learning course together with a lot of useful information about the game. We would like to thank everyone for their engagement, and wish you success in conducting New Shores game sessions!